The whole family: Steve, Sierra, Kelley, and Clay. The territory of the unknown is one often accompanied by fear. This was the case for Kelley and Steve, when at 20 weeks into their pregnancy, they learned that there was an issue with their baby; its lower right leg had not developed correctly. The baby’s femur, the bone above the knee, was where the limb ended. This unexpected news was difficult to process at first. They worried for the future of their child. How were they going to prepare for this? What questions did they need to ask? Suddenly, Kelley and Steve were thrown into a world they knew little about: the world of limb-loss and limb-difference. 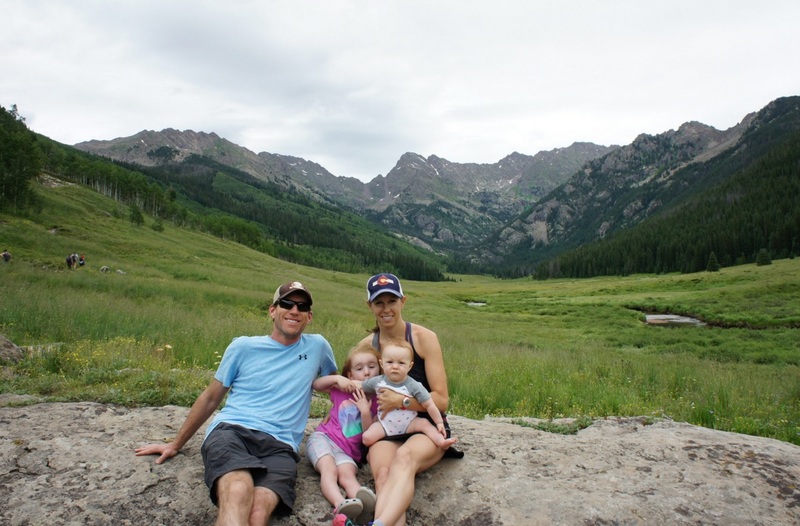 In addition to preparing for the arrival of their second child, Kelley, Steve, their 4-year-old daughter, Sierra, and their beloved Labradoodle, Luna, had just relocated from San Diego to Denver. Though they knew they left behind a great support system in SD, they immediately hit the ground in Denver looking for resources and connections in the limb-difference community. “We wanted to build support for our whole family, in addition to the baby,” says Steve. Of the many resource they found in Denver, Kelley and Steve got linked with LIM359, attending events even before their baby’s birth. LIM359 helped to alleviate many of the unknowns, along with the fear and weight that came with it. Kelley and Steve quickly learned that although life looked different, and at times more challenging, it could still be a normal and fulfilling life. Meeting other individuals with limb-loss and limb-difference was helpful for Steve and Kelley, but the most reassuring interaction was the one yet to come. On December 3, 2014, their son Clayton was born. Now 10 months old, Clay hardly seems to be slowed down by his missing right leg. He is already crawling, tackling stairs and lifting himself to stand with the help of mom and dad (although getting back down is a bit difficult). Though he is doing quite well with just one leg, Clay is currently in the process of having his very first prosthetic limb made – just for him! “It’s crazy to look back to a year ago and think about how concerned we were, how worried. We quickly learned that really, there isn’t too much to be concerned about. Yes, you are going to worry about your kids, we worry about our daughter too,” says Steve. **If you or someone you care about has learned that their child will be born with limb-loss or limb-difference and would like to talk to someone, Kelley and Steve welcome you to contact them at kelleyruss@yahoo.com or steve.simon.pe@gmail.com. Awesome story. I met you last year and can’t wait to meet the kids at a future LIM359 event. You will all do great in life! This is my awesome grandson. He is amazing us with his ability to adapt. Great story on great parents and kids. The Simons are an exceptional couple of parents and it shows in both children. They are very active outdoors and Clay benefits from their healthy lifestyle.